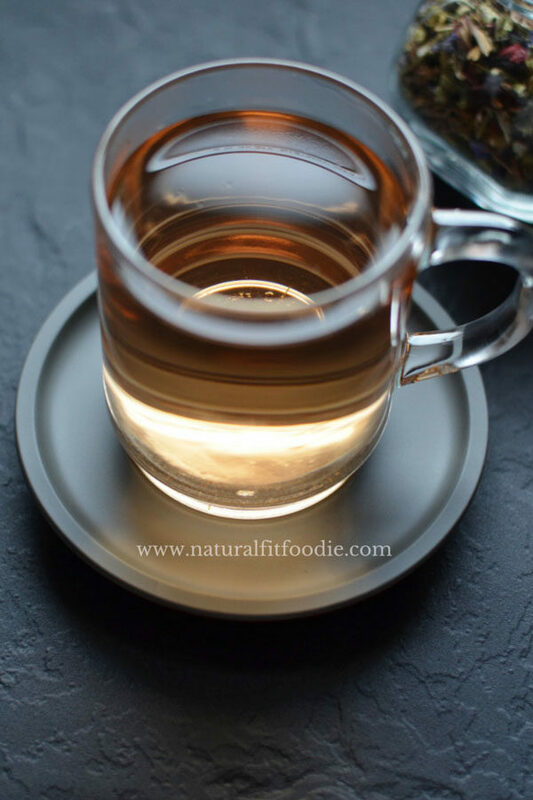 This anti inflammatory weight loss tea is a natural, gentle detox that reduces bloat and water weight leaving you feeling light and energised! I am a tea lover. I drink tea by the flask full daily. I also bore easily so to keep things fresh I have a wide variety of teas. You do not want to see the designated tea shelf in my kitchen. It’s completely out of control! We plan to renovate our kitchen soon… yippee and hubby has already told me to make sure and plan out a special place for all my teas. Yes it’s that bad. The thing is you can’t really go wrong with tea. It’s the perfect low-calorie flavored drink. Recently my fingers were swollen for an entire month. I had been reluctantly taking dr prescribed meds but they weren’t helping. Then I decided to experiment with some herbs. I came up with this combination and started drinking it religiously. After 1 week the swelling reduced and unexpectedly my pants were fitting looser around the waist. After 2 weeks of drinking the tea I got up on the scale and to my surprise I had dropped 6 pounds! Keep in mind that because my fingers were swollen so badly I wasn’t even going to the gym or doing any exercise, just drinking this tea and eating clean of course. 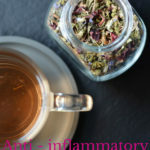 The diuretic properties of this anti-inflammatory weight loss tea will help to reduce bloating and water weight. I must warn you that it will make you go frequently to the bathroom, that’s why I usually have this tea first thing in the morning. If you can get your hands on these herbs I highly recommend this infusion. Try your local health food shop or you can order them online from the comfort of your home at Amazon . I have included links for all the herbs you will need. As someone who suffers from occasional joint pain and swelling I can tell you that this anti-inflammatory weight loss tea has been a lifesaver! anti-inflammatory agent for the respiratory tract, the skin, and the gastrointestinal tract. used in traditional herbal medicine for the treatment of gallstones, kidney stones, kidney inflammation, headache, constipation, gastritis, toothaches and insomnia. I am not a trained dietitian, nutritionist, chef, or medical professional. The information on this blog is based on personal research, and experiences. Statements within this site have not been approved by the FDA. Content should not be considered a substitute for professional medical expertise. The reader assumes full responsibility for consulting a qualified health professional before starting a new diet or health program. Please seek professional help regarding any health conditions or concerns. The writer(s) and publisher(s) of this site are not responsible for adverse reactions, effects, or consequences resulting from the use of any recipes or suggestions herein or procedures undertaken hereafter. 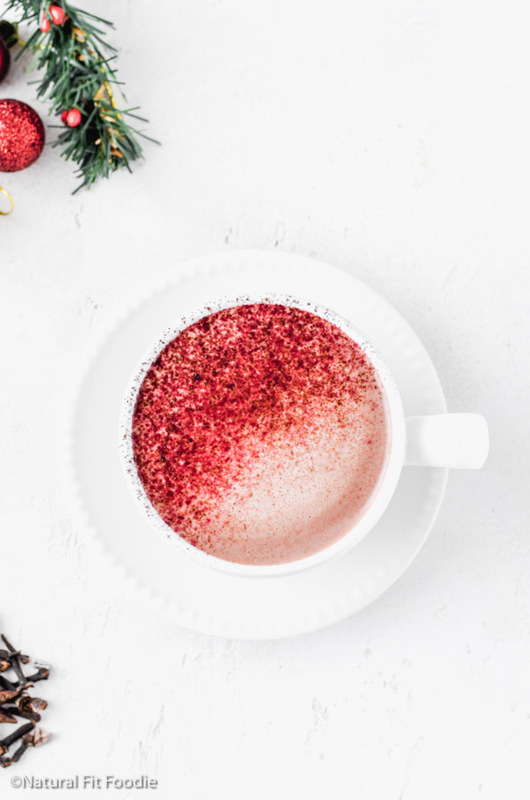 Looking for more healthy drink ideas? Follow my Drinks board on Pinterest! Follow Natural Fit Foodie’s board Eat Clean / Gluten Free Drinks on Pinterest. Combine all herbs in a tight closing jar and store in a cool dark place. 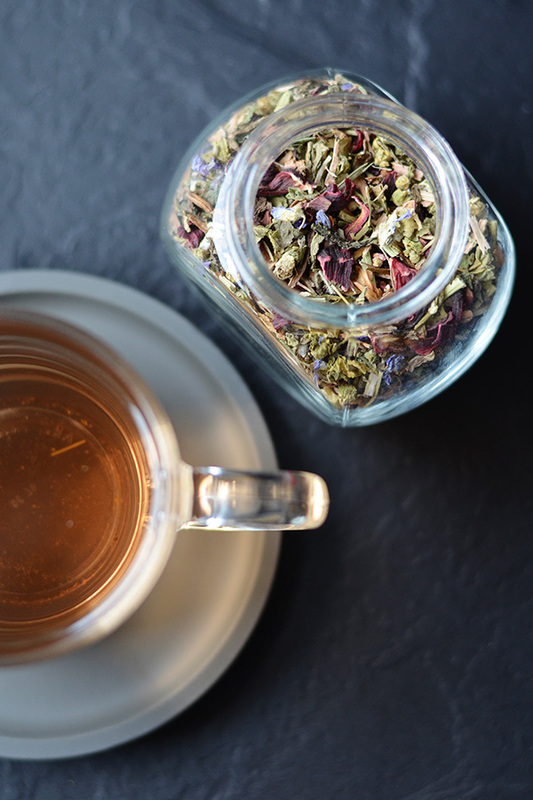 For each serving of tea, steep 1 tablespoon of the mixture together with 1 cup hot water for 3 to 5 minutes. What a healthy and very pretty tea! What a great combination of herbs. I love anything hibiscus. What a lovely blend! So pretty too. Oh this is so neat! Very interesting! Thank you! I liked learning about willow and mallow. I don’t think I’ve had those before. This sounds great. Thanks for sharing it. I love tea blends too. Me too Jennifer! I had been drinking dandelion tea for sometime before I decided o try this blend and I love it! You think I can find this stuff in Trini? Hi Kim can you order them online? I have provided links to amazon in my post. If not, my mom who lives in Trinidad has found everything locally except the high mallow. To start with try and get your hands on the dandelion and hibiscus. You can always grate a bit of fresh ginger into the tea if you can’t find dried. I wonder if you could use Rose Mallow and any hibiscus like a Rose of Sharon? The tea looks so beautiful. I love tea, too. This sounds like a lovely blend. Thanks Chloe, I like it a lot! 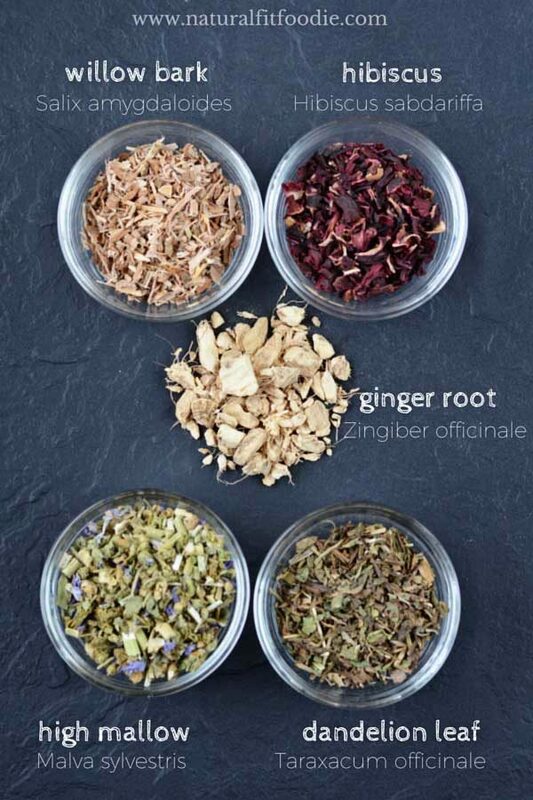 Hi Debbie, if you can get your hands on the other herbs then make the blend without it. Mallow (Malva Silvestris) is quite unique so possibly the most difficult to find. where do you purchase all the ingredients? Hi Evelyn I was able to get all of the ingredients at my local health shop (I live in Spain) but I have included links to Amazon if you are able to purchase online. Hello Krystal, I have read your recipe for this tea. It sounds perfect for me. I don’t think I will have any problem finding the ingredients. My problem is that your site doesn’t say how much of each ingredient to purchase . Do you gather all the ingredients and mix theme together? How much of each ingredient do you throw into the mix. After the mix is made, I get that you only need one tablespoon to brew. I hope you can clear this up for me. Hello Olga,I never measure out the herbs. I gather them all up and mix together in a glass bottle. If I have to think about it probably I put the most of the dandelion leaf, then comes the high mallow and willow bark in equal amounts, a bit of hibiscus and then the ginger. I’m sure the amounts are different each time but the tea is always effective. Hope this helps. Thanks! It’s very difficult to find high mallow and willow bark in local store so started with other ingredients .. Just wanted to know we can add this powder to black tea with little sugar .i found the taste is bit sour .waiting for your valuable answer . Hello Leena! I find this tea to be extremely mild tasting . I never take sugar with my tea and I won’t recommend it. 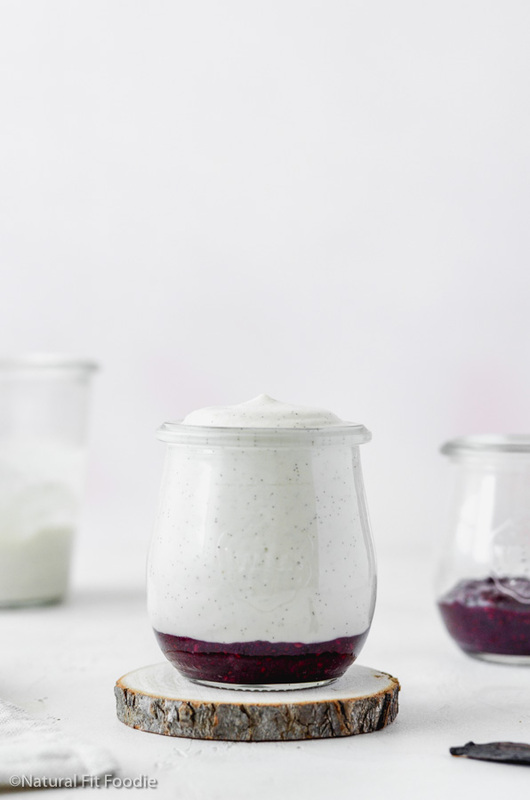 Perhaps you can add a few dried dates, raisins or cranberries to the mix for natural sweetness. Raw honey, stevia and maple syrup are a few other healthier options. Thanks for your support Leena! How many cups of this should you drink per day? Hi Kris I make a 500ml flask every morning. That’s about 2 cups. Is there something I can substitute for the ginger, as I am deathly allergic? Would Cinnamon be an appropriate substitute? Thank you. This tea sounds good otherwise! On my first cup and absolutely love the taste. Hoping it will help ease my inflammation due to my Crohns Disease, and could def do with some weight loss after the steroids. Happy you like it Beth! Please let me know if you see improvement in your symptoms . Please see the recipe card at the bottom of the post. Sorry to hear you’re in pain 🙁 Please let me know how this anti-inflammatory tea worked for you Tina. I wonder if this can be taken in combination with a diruretic? Hi Nancy this anti-inflammatory tea is quite diuretic in nature so probably not.